The limitless ability of God is beyond what I can wrap my brain around. However, just because I can’t understand something doesn’t mean it isn’t true. Light travels at 299,792,458 metres per second whether or not I understand how it does it. I don’t worry about how it works, I just flip on the light when I need to. 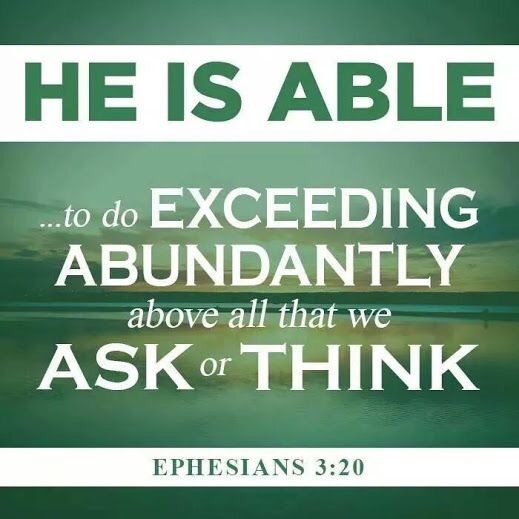 God is not merely able but abundantly and generously able, with an infinite surplus of resources and eternally able to “do what he had promised”. He is the God of limitless resources- the only limit comes from us. Our requests, our thoughts and our prayers are too small,and our expectation are too low. God is trying to raise our vision to a higher level, call us to have greater expectations and thereby bring us to greater appropriation. Shall we continue living in a way that mocks His will and denies His Word? You don’t have to understand how God will provide, you just have to trust Him to do it. You don’t have to figure out how God is going to fulfill His part, you simply have to do your part and step out in faith. Let the worry go to the wind and the anxiety drift to the bottom of the sea. Stop trying to figure out how it is going to happen and just do what you know God has asked you to do today. Years ago a good friend told me, “When God guides, He provides”.